Drivers aged 16 to 19 are four times more likely to die in a crash than drivers between ages of 25 and 69. Teens have the highest chance of being involved in a fatal car crash in the first six months of receiving their driver's license. 2,739 teenagers died in motor vehicle accidents in the United States during 2008. 5,864 fatal motor vehicle accidents involved teenage drivers in 2008. Of those accidents, 2,739 teenagers died. Male teenage drivers are twice as likely as female teen drivers to be killed in a crash. 55% of all teens killed in car accidents weren't wearing their seat belts. 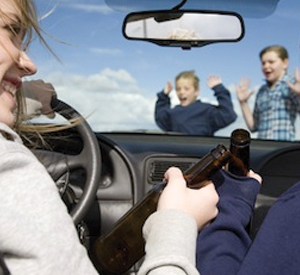 31% of teenage drivers were drinking alcohol at the time of their death. When teenage passengers are killed in a motor vehicle accident, the driver was a teenager 63% of the time. Quick: What do you think is the leading cause of teenage deaths annually? If you said "drugs," you'd be wrong. If you said "guns and firearms," you'd be wrong. If you said "gang violence," you'd be wrong. If you said "suicide," you'd be wrong. As a leading Boston car accident law firm, we can tell you: It's car accidents involving teenage drivers. According to a recent study by the Insurance Institute for Highway Safety, motor vehicle accidents are the leading cause of death for teenagers in the United States. The National Highway Traffic Safety Administration has documented that more than 2,000 teenagers die in car accidents annually and approximately 200,000 more suffer various types of injuries. Aside from the 2,000 killed each year, more than 5,000 additional teenagers are involved but not killed in fatal accidents. In Massachusetts, approximately 50 teenagers are killed each year in car accidents. Worse, it's also more likely that teenage drivers will end up killing the passengers in their vehicles, rather than themselves, when they are involved in a collision. The first reason? Texting and cell phone use when driving. A deadly combination. They are very prone to drive while drunk or to ride as passengers in a vehicle when the driver has been drinking. They lack driving experience, which limits their ability to respond rapidly and safely to other drivers or to react appropriately to negative weather conditions. They often drive with too many friends in the car and pay more attention to passengers inside the vehicle instead of other cars or hazards on the road. And - believe it or not - many teenagers, when driving, actually listen to music using earpieces, with iPods and smartphones. Also, many teenage drivers don't wear their seat belts, which only makes the injuries suffered in a motor vehicle accident much worse than they might have otherwise been. What you should know immediately is that Massachusetts law imposes legal and financial liability on the person who was responsible for these accidents. To learn more about what your legal rights to financial compensation are following a teen car accident, contact us today for a FREE consultation by calling Ph: (781) 320-0062 or Ph. : (617) 285-3600; or email us and we will get right back to you . When a teenager suffers a serious injury in a car accident, it is especially difficult for a family to deal with. When a death occurs, it is indescribably painful for the parents and family members. Making matters even worse is that car accidents involving teenagers generally also involve friends of the teenager, and the families of those friends. Dealing effectively with the parents of such victims requires special understanding, and expert-level ability to guide them through the legal process involved. This situation demands aggressive litigation strategies, combined with tactical diplomacy, to achieve the best legal results possible. At the Law Offices of William D. Kickham, we know from successful experience what it takes to turn these cases into justice for our clients. Investigating and litigating a personal injury or wrongful death claim against a teenage driver in a car accident requires special investigative skills, proven legal talent, and even unusual social skills: Teenagers can be famous for "shutting up" when it comes to telling their stories, for fear they may be ostracized in their social circles for "saying the wrong thing" about what really happened. It takes experience and skill to get to the truth in these situations. All legal claims stemming from teenage car accidents will involve automobile insurance policies on any vehicles in the accident, and possibly homeowners' insurance policies as well. The bottom line is that insurance company lawyers are involved at every stage of these proceedings - and they fight very hard to prevent injury victims' from receiving adequate compensation for the injuries involved. If your lawyer is not both extremely experienced and extremely successful at securing top dollar results in these cases, your case will suffer. We have that experience and talent, and we know how to get top dollar results for our clients. Who is Liable for Damages When a Teenage Driver is in a Car Accident? If your teenager is determined to be at fault for the accident, then it may be difficult to recover damages for him or her. However, Massachusetts law requires that all persons registering a car buy personal injury protection ("PIP") from their own insurance company. PIP coverage provides up to $8,000 for your teen's medical costs and any lost wages, even if the teenage driver was determined to be at fault. People who are injured by a teenage driver may make claims against the teen for damages, assuming, of course, they can prove that the teen driver was negligent. In what surprises a lot of people, teenage drivers are held to the same "reasonable person" legal standard of care when operating a motor vehicle as adults are held. As a result, teen drivers can be sued when they breach that legal standard. Importantly, since an insurance company will defend the teenage driver and pay for any damages or settlement if the case goes to court, the fact that it is a teenager being sued, and the fact that most teenagers have no assets, should not discourage any injury victim from suing. Sometimes, damages from the accident are more than the insurance policy limits provided by the teen driver's insurer. In that event, it is often necessary to sue the parents of the teen, if evidence indicates that they were negligent in their supervision of the teen. Also, sometimes a third party (aside from the teen) either caused the accident or contributed in some way to it. In that event, a claim would need to be made against that driver. We know from successful experience how to identify the appropriate defendants in these types of situations. You should not speak with a law firm that does not handle these types of cases on a regular basis - that is not advisable. We have the EXPERTISE the RESOURCES, and PROVEN ABILITY to successfully investigate and litigate your case to the best legal and financial outcome possible. If your teenager has been injured in a Boston Massachusetts car accident, contact the Boston injury lawyers and wrongful death attorneys at the Law Offices William D. Kickham now. We can be reached 24 hours a day at: Ph. (781) 320-0062 or Ph. : 617-285-3600. We'll provide you with a free, confidential consultation, and will explain your legal rights and options in detail. You may recognize Attorney Kickham's name from seeing him on television or in the news. Attorney William Kickham is frequently sought out for his legal expertise by a variety of newspapers, TV and radio stations. Some of these news organizations include, among others, Court TV (now In Session on HLN ,) Fox News TV-25/Boston, The Boston Herald, WBZ-AM Radio 1030, WCVB-TV5/Boston, Nightside With Dan Rea, Greater Boston With Emily Rooney, Money Matters Radio/Boston, and The Metro Newspaper/ Boston. News reporters call Attorney William D. Kickham because they know he is an expert in the field of Massachusetts injury law. This is our promise to you: If we accept your case, we will not rest until we secure the maximum financial compensation possible for you. Call us at Ph. (781) 320-0062 or Ph. : 617-285-3600, or email us. We can help you.